These flowers are from my backyard. They are not just any flowers…the original bulbs belonged to my grandmother (my daddy’s mother) years and years ago. My grandparents lived out on the farm, and I’m told my grandmother had these flowers planted by their house. My mother got bulbs from my grandmother’s garden, and then many years later I got some bulbs from my mother. I hope to eventually give some to our daughter to plant at her house. That would be the fourth generation. What would really be neat would be to take a picture of the grandbabies in front of these flowers that came from their great, great grandmother’s garden. That would be a special picture! 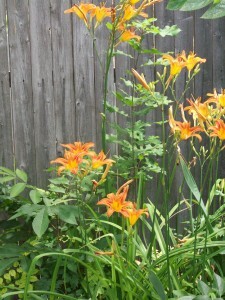 This entry was posted in Family & Friends and tagged flowers in backyard, grandmother's flowers, lilies by Charla. Bookmark the permalink. The flower looks quite beautiful with its mixed shades of yellow and red and with the story of love attached to this will indeed seem to be a special one for the whole of family.